The cost of fishing in Kansas will be headed down this first weekend of June, the 2nd and 3rd. It’s the annual free fishing weekend offered by the Kansas Department of Wildlife, Parks and Tourism. Normally all people 16 through 74 must have an angling license to fish public waters in Kansas. The cost is $27.50 for an annual resident permit. Seniors 65 through 74 pay $15 per year. The free fishing weekends are designed to give beginners a chance to try angling, hoping they’ll enjoy it enough to take up the sport. It’s also hoped some who haven’t fished in years will brush the dust off an old rod and reel, maybe dig a few worms in their garden or pick up a couple of cheap lures and try their luck again. The lack of license cost may also make it easier for people to introduce their friends and family to the sport. Kansas is blessed with hundreds of public places that could be perfect for those trying their luck. While the state has about two dozen large, federal reservoirs, smaller waters are often better for beginning or casual anglers. Wildlife and Parks owns, manages or leases over 100 county or community lakes and ponds across the state. 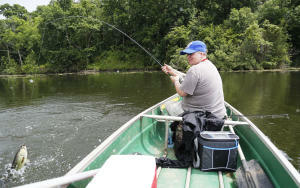 They also lease some prime privately-owned waters and open them to public fishing. That includes some good fishing holes well within urban areas. Click here to learn more about public fishing opportunities in Kansas.